We believe you need mass spectrometer training from the people that know the technology, applications, workflows and methods the best. That’s why SCIEXUniversity offers the most diverse and flexible learning options available, with best-in-class content that helps you to get the most out of your instrument and take your lab to the next level. Access over 100 courses delivered by our applications and service specialists directly to your computer. Choose a personalized learning path that combines online courses and hands-on training. Visit one of our purpose designed training centers for hands-on instructor-led training. Let one of our applications experts deliver customized tutorials and courses. With your username and password, you can see all your enrolled and completed courses, print your certificates, manage your transcript or browse the course catalog. SCIEXUniversity can take you beyond online courses. Choose from Success Programs: personalized, blended online and in-person courses, onsite training or a visit to a SCIEX training center. 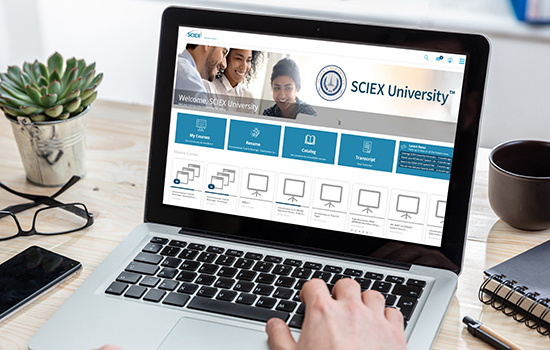 With over 100 online courses you’ll be able to experience the high quality learning content available in SCIEXUniversity. Watch this video to discover how SCIEXUniveristy can meet your training needs. We are much more than online courses. For the most comprehensive option, you can select Success Programs: personalized, blended online and in-person courses. If your needs are met by a visit from one of our training experts, you can choose multiple Onsite Training days to get your lab running. A great continuing education session. Very professional and well done!